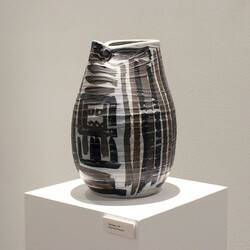 "First level," high-fired stoneware by SFA graduate student Erik Ordaz Lozano, is among the works that will be exhibited during an open studios event starting at 6 p.m. Tuesday, Dec. 11, in the art building off of Wilson Drive. NACOGDOCHES, Texas - Graduate students in the Stephen F. Austin State University School of Art will host an open studios event and ceramics sale for the public and SFA community on Tuesday, Dec. 11, in the art buildings off of Wilson Drive. Open studios events allow the public to view artists' working spaces as well as recent and in-progress work. Students will be available to talk with visitors and answer questions, and some artists will have works for sale. Graduate studios are located in both the upper and lower SFA art buildings. The ceramics sale will include both graduate and undergraduate work. "This opportunity to acquire beautiful, handmade pottery comes just in time for the holidays," said Amanda Breitbach, assistant professor of art at SFA. Open studios begins at 6 p.m. following Portfolio Night, an exhibit of student design portfolios in the lower art building gallery. The ceramics sale will begin at 4 p.m. during Portfolio Night and continue until 8 p.m.
For more information, contact the SFA School of Art at (936) 468-4804.